Blue Fronted Amazon parrots, Amazona aestiva, are beautiful Amazons that are mostly green in color with differing amounts of blue and yellow on their heads. Each individual is uniquely colorful. The nominate subspecies A. a. aestiva has red on the bend of the wing, while the subspecies A. a. xanthopteryx has yellow on the bend of the wing. We currently breed both subspecies of Blue Fronted Amazons. In the wild, the Blue Fronted Amazon has a large range and is found in Brazil, Paraguay and in northern Argentina. Blue Front Amazons typically range in size from 13-15 inches and weigh between 375-500 grams, depending on the subspecies. Our Blue Fronts tend to be on the medium to small size. Blue Fronted Amazon parrots are very playful and outgoing. They love to be in the center of things, and adore attention. They are joyful, and can be really sweet. They are also dominant birds that need definite boundaries set to keep them sweet and well behaved. They are vocal and tend to pick up a large vocabulary early that they continue to expand throughout their lifetime. Blue Fronted Amazons tend to be one of the more empathetic Amazons; they sense how you are feeling and respond accordingly. One time I returned from a business trip and was so exhausted that after letting my Blue Fronted Amazon, Watson, out of his cage, I lay down on the couch to take a power nap. He climbed down and came over to me saying “are you all right?” I laughed so hard, that was the end of my nap! It is easy to teach these intelligent birds many phrases, songs and tricks. They can call fairly loudly, especially at feeding times. And they can get in a “talking rut”, and spend an hour repeating everything they know how to say. Blue Fronted Amazons are responsive to attention, praise and appreciation. While most Blue Fronted Amazons tend not to be especially physically affectionate, they do enjoy a good head skritching, especially in the evening. When mature, Blue Fronted Amazons can act out a bit during breeding season, usually in the early spring, though they tend not to be as aggressive as the Yellow Amazons. 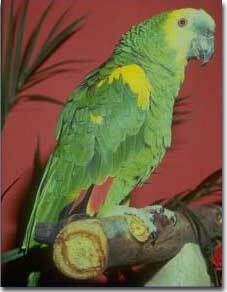 Luckily, Amazon parrot behavior is easy to read - eyes pinned and tail fanned is a good indication not to pick your Amazon parrot up at the moment, or to use a stick if it is necessary. See the Amazon parrot page for more information about this behavior. Blue Fronted Amazons make a wonderful companion and bring joy into any household. There isn't a day you won’t laugh with a Blue Fronted Amazon companion.